a record or memoir: Mrs Carlyle’s Letters and Memorials. Opportunity to take your two-faced taxpayer-funded arse on a free trip to pretend you have respect for someone you don’t. 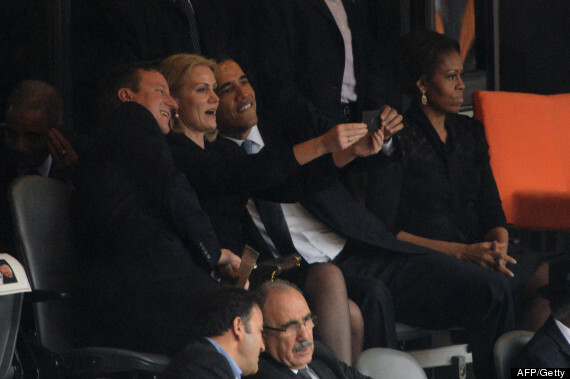 An event seen by people from around the world where you can embarrass not only yourself but also dishonour your country by inappropriate behaviour, such as taking ‘selfies’ with other World Leaders. Now let me understand this, we the people of Gt Britain are frowned upon for ‘celebrating’ the demise of an ex Prime Minister who cause misery, poverty and heartache upon a great many citizens and their families but it’s ok for YOU to be totally disrespectful at a memorial service for a man loved by many (you probably wouldn’t understand that concept), is that right? You Dave work for us whether you like it or not. If you can’t accept that and understand that within your role as OUR representative there are standards to uphold and expectations to meet the do us a favour and bugger off so that we can be represented by a decent human being, not an attention seeking junkie. Can I just remind you of the Ministerial Code document (2010) which can be found at https://www.gov.uk/government/publications/ministerial-code and highlight specific text written by you as a foreword. Dave, you let us all down today. Mandela brought freedom to south Africa, to celebrate life and death in the African way . This was a celebration of a free African life, forget about putting your British perspective on the celebration of his life for a day ms sarahtomkins. I agree whole-heartedly with your response on how our representatives should behave. South Africa is celebrating The Great Man’s life in such a glorious way I just wish to say (which i couldn’t be bothered to before!) that maybe the offending incident was, although ill-judged, not as disrespectful in it’s context as if it was in UK. As you say freedom of speech and all that ! Please don’t think I am not applauding you for making the effort to let the politicians know! Thanks! Nor then would he be offended by someone taking a harmless ‘selfie’ at his memorial. One can’t have it all ways. I personally think the massive outpouring of grief over a man not averse to the use of violence is somewhat disturbing. It’s almost like a large part of his history has been completely airbrushed out of existence. Even if the ideology and political system he was fighting against was inherently wrong, the deaths caused by pro-apartheid forces have been vastly outnumbered by the deaths since apartheid was abolished (white farmers, black on black murder in the post-apartheid power vacuum) so of what real benefit what his struggle? One could pretty easily substitute the story arc of Gerry Adams for Nelson Mandela and ask, would flags fly at half mast and would world leaders turn up for that one? Mandela did not bring freedom to South Africa, ask the majority of black South Africans. 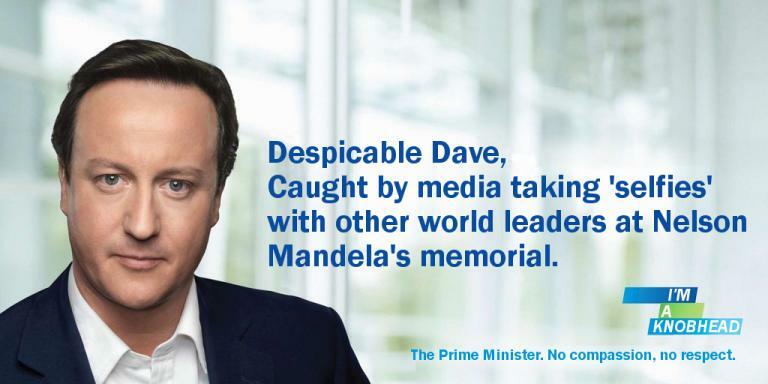 Just as Dave has not bought stability or dignity to this country.